Later this morning, Mayor Vincent Gray, Councilmember Kenyan McDuffie (D – Ward 5), and representatives from DC Water and District agencies, will announce the creation of a task force to address the flooding that has occurred in numerous basements in LeDroit Park and Bloomingdale since July. The mayor and councilmember will hold the press conference today at 11:30 am at the park at triangle park at First Street and Florida Avenue NW. During several downpours in July, the overtaxed sewers below Florida Avenue in LeDroit Park and below several streets in Bloomingdale backed up into residents’ basements. DC Water, the semi-independent agency that manages the drinking water and sewer infrastructure, says the completion of new diversion sewer tunnels in 2025 will solve the problem for good. Waiting 13 years is little consolation for residents whose basements have flooded with diluted sewage. Channel 4 has a short segment on Tuesday night’s flooding in Bloomingdale and LeDroit Park. The Post also has a story describing the sewage-drenched nightmare that struck many residents’ basements. We’ve received a number of phone calls, tweets and email inquiries from Bloomingdale, LeDroit and Eckington customers who faced flooding last night. We’re so sorry to hear this has happened, and want to provide some background information as well as next steps. The sewer system under this part of the District was installed generations ago by the federal government. At the time, populations were smaller, rains were likely lighter, and people weren’t commonly living in basements. The system was not designed to handle the volume it handles today. We inherited this system and are working to upgrade it, but this is not a fast, simple or inexpensive process. We do clean every catch basin in the District once a year, and we come through flood-prone areas to do more cleaning every time a big storm is predicted. This one was not part of any weather forecast. The volume of rain in such a short period would overwhelm many catch basins as well. The best short-term solution is a backflow preventer, which a licensed plumber can install. The long-term solution is enlarging the capacity of the sewer system, which will come as part of our Clean Rivers Project. It is a 20-year, $2.6 billion effort to build 13 miles of tunnels, which will capture stormwater and sewage and send them to our Blue Plains Advanced Wastewater Treatment Plant. The tunnel will start at Blue Plains and is under construction now. The last segment will make its way from RFK Stadium to Gallaudet University and will relieve the historic flooding problems in Bloomingdale, Eckington and Edgewood. More details are here: http://www.dcwater.com/workzones/projects/anacostia_river_information_sheet.cfm. Customers with questions can feel free to email us at twitter@dcwater.com or call (202) 612-3400 anytime. There are two things to glean from the comments section in yesterday’s post. One is that a number of Bloomingdale residents have said that flooding occurs in their basements more than once a year. Another is that DC Water’s solution, which includes the construction of an interceptor sewer tunnel, is years away. DC Water will address residents on Monday, July 16 at 7 pm at St. George’s Episcopal Church at 2nd and U Streets NW. 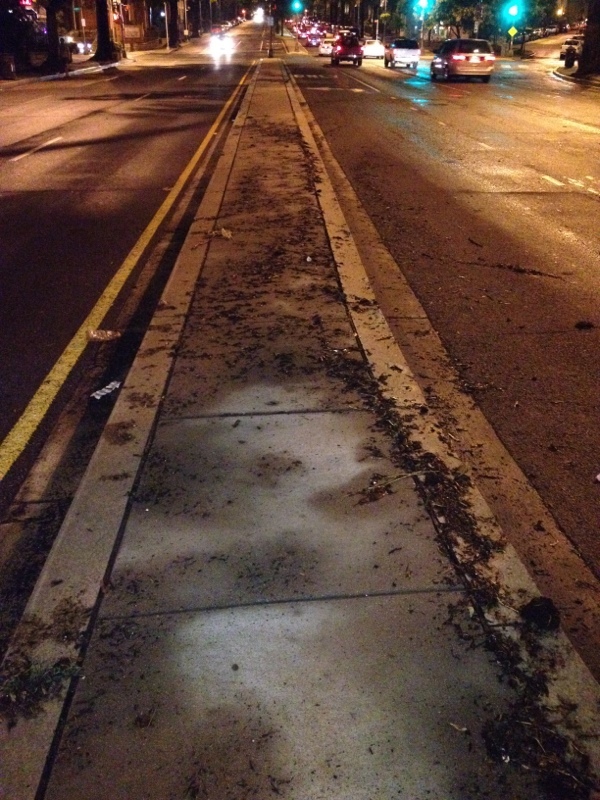 During torrential downpours the Bloomingdale neighborhood experiences flooding. Yesterday evening’s storm flooded numerous Bloomindale basements and the intersection of Rhode Island Avenue, T Street, and First Street NW. The Boundary Stone restaurant (116 Rhode Island Avenue NW) posted a photo of a flooded Rhode Island Avenue NW. Why did this section of the street flood? 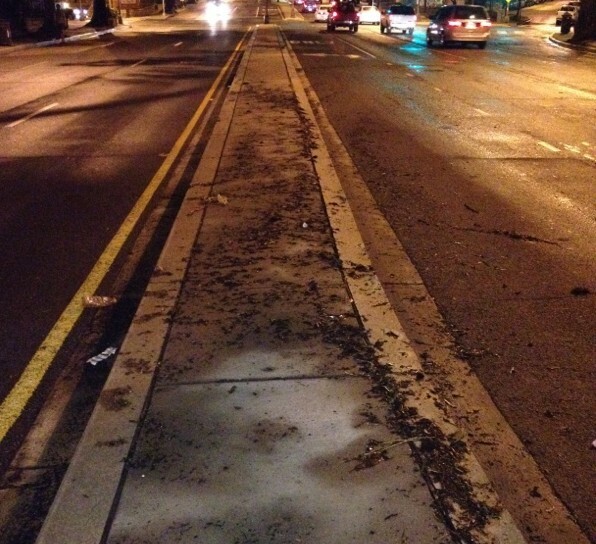 DC Water, which runs the water pipes, sewers, and storm drains, blames the lack of pipe capacity in Bloomingdale. 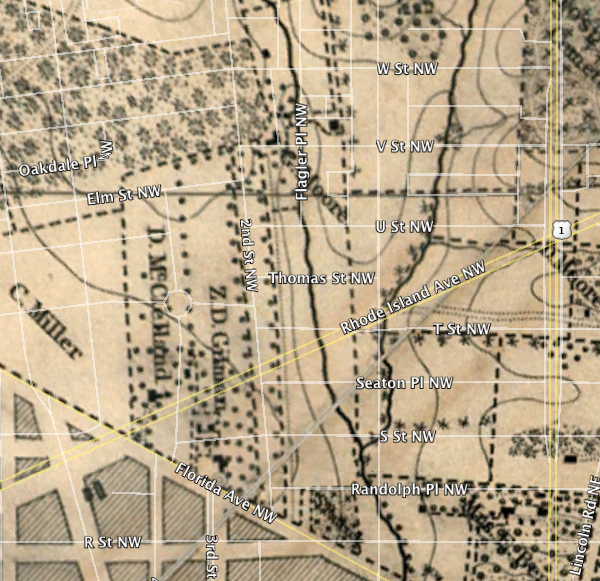 A closer look at the 1861 Boschke map of the District of Columbia reveals that the northern reaches of Tiber Creek flowed right through Bloomingdale. In fact the creek flowed right where Rhode Island Avenue flooded at T Street NW. Whether the creek still flows underground in this location is something I will leave to experts. However, creeks, like all water, flow to the lowest point on the land. The creek’s former presence at this location suggests that the terrain slopes downward on all sides, directing rainwater to this critical flood point. Ward 5 Councilmember Kenyan McDuffie (D) was on the scene and DC Water has promised to brief him soon on their Bloomingdale flood solution, which they say is on the way. Though this degree of flooding is rare, Bloomingdale residents will surely welcome and demand a permanent fix. Every now and then the Census Bureau or some organization releases a report or new data showing that DC’s demographics changed. A recent analysis of census data found that the 20001 zip code, which covers LeDroit Park, Pleasant Plains, Bloomingdale, Truxton Circle, Shaw, and Mount Vernon Square, saw its non-Hispanic white population increase by 27.2 percentage points from 5.6% to 32.8%. In fact, 20001 made the list of “most-whitened zip codes” in the nation. Our review of the 2010 census data found that LeDroit Park is 21% white, which is below the figure for the zip code. What does this mean? Without more information, the report doesn’t mean much other than the unsurprising fact that neighborhood demographics change. This plain answer will dissatisfy some. In a city in which identity is inevitably intertwined with politics, many will feel compelled to read too much into the data for some larger narrative that confirms preexisting social or political views. However, the reasons that people move into and out of a neighborhood are complicated and there are both push and pull factors, both voluntary and involuntary. Your new spouse wants to live elsewhere. You graduated from the local university and intend to return to your hometown. You dislike too many of your neighbors. You got a new job far away. The rent has become unaffordable. You lost your job and can’t pay any rent. You want to retire closer to where your children live. You want to send your children to school elsewhere. You’re pursuing a degree somewhere else. You are born and that’s where your parents live. You found the perfect home. Friends and family are nearby. There are people like you nearby. You got a new job nearby. You’re moving in with friends or relatives. Rent is cheaper here than in some other place. The neighborhood is visually appealing. Each person’s story is different, but there is far more at work than the simplistic displacement narrative that gets so much press. The Post is running an article about the battle over control of Crispus Attucks Park in Bloomingdale. The park is a hidden gem in Bloomingdale. It’s embedded in the middle of the block bounded by North Capitol Street, U Street NW, V Street NW, and First Street NW. The park is on land once owned by C & P Telephone, but which was transferred to a non-profit in the 1970s. But who controls the non-profit that controls the park? Aye, there’s the rub. LeDroit Park and Bloomingdale history buffs need to mark their calendars for Thursday night. The LeDroit Park-Bloomingdale Heritage Trail Working Group will meet to go over updates to the pending bi-neighborhood heritage trail. You’ve seen these heritage trails elsewhere in Washington. The signs feature historical photographs and explanations of the areas’ historical significance. At the last meeting we attended, we heard from residents who lived in the neighborhood that stood where the Gage-Eckington School was later built, neighbors who had to walk several extra blocks to school because Washington ran a segregated school system, and neighbors who remember seeing Eleanor Roosevelt visiting what is now Slowe Hall at 3rd and U Streets. These are the oral histories that Cultural Tourism, which organizes these trails, documents for the historical record and includes in the signs. So much of Washington’s history, nay human history, is committed to memory that if we don’t record it, it risks being lost. The trail, which is put together by Cultural Tourism DC, is close to completion, but the next few meetings are critical in determining final details and extra stories that may be incorporated. Even if you don’t have stories or original research to contribute, attending the meeting solely to listen will be worthwhile. Who are your neighbors? 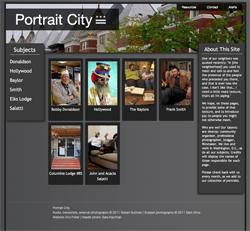 In December, LeDroit Park resident Robert Sullivan launched a website Portait City that features audio and photographic profiles of several LeDroit Park residents. You may not know these subjects personally and perhaps maybe you have seen them in the neighborhood. Nonetheless, they each provide a fascinating mosaic of LeDroit Park. Interview subjects include Bobby Donaldson, the South Carolina native who opened B&J Barbeque at Rhode Island Avenue and 3rd Street. You’ll find out what inspired him to open a restaurant and what people like in their barbeque. LeDroit resident and former Ward 1 councilmember Frank Smith spent part of his youth as a civil rights worker in rural Mississippi. Mr. Smith recorded and reported civil rights abuses, such as bogus “literacy tests” that southern states used to prohibit black residents from voting. Here how he reacted to Marion Barry’s infamous arrest. Hear from the Elks Lodge and their relationship with the neighborhood. You can also hear Elks reminisce about performances at the Howard Theatre back in the day. The flamboyantly dressed “Hollywood” explains his eclectic attire and Bloomingdaler John Salatti sings the praises of his wife and Bloomingdale. Finally, Robert was able to interview LeDroit residents Dolores Baylor and her daughter Mechelle just before Dolores died in December. Mechelle explains what it was like growing up in the neighborhood and Dolores recounts what it was like living through the riots of 1968. The lives of famous figures in history are well-documented, but it is also important to record the experiences and views of the not-so-famous. Robert contracted your author, who is a professional web developer by day, to build the site. While building the site, we couldn’t help but notice that each story delivered its own unexpected poignancy. Two century-old DC fountains sit decaying and neglected in the woods of a national park in Maryland. The fountains had been missing from the 1940s until they were rediscovered in the woods of Fort Washington National Park in the 1970s. The top portion of the McMillan fountain, pictured below, was returned to Crispus Attucks park in the Bloomingdale neighborhood in 1983. 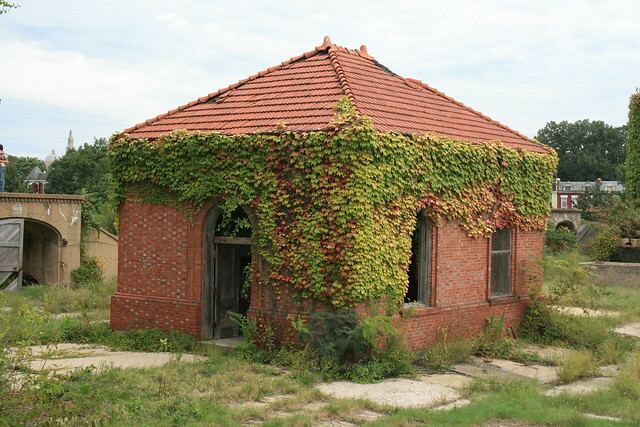 In 1992 it was moved back to the fenced-off grounds of the McMillan Reservoir just a few blocks away. 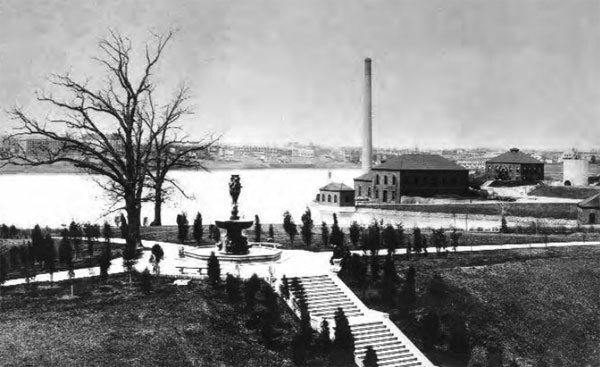 The fountain was installed in 1913 at the McMillan Reservoir as a memorial to Senator James McMillan (R – Michigan), who is more remembered locally for his his ambitious McMillan Plan to beautify Washington. The fountain was dismantled in 1941, when the reservoir was fenced off from the public. Top of the McMillan Fountain today (left) and in 1912 (right). Though the top of the McMillan Fountain had been restored to the reservoir grounds, a Bloomingdale ANC commissioner told me the base of the fountain was in the woods in Fort Washington along with the remains of the fountain that stood at the center of the now-razed Truxton Circle. I went to Fort Washington in search of these discarded works of art. I asked a park ranger where the fountain was and she drew me a map, saying that it stood in the park’s “dump” and partly behind a fence. I went to the picnic area nearest the site and walked into the woods a short distance where I found a fence. Behind it stood piles of bricks and other discarded building materials. Beside the site is a dugout that serves as the back court to Battery Emory, a concrete gun battery built in 1898 to protect the capital city from enemy ships. As I passed through the unfenced dugout, I immediately spotted few granite blocks that served as the cornerstones of the base bowl. Though they are strewn about the ground, a 1912 photograph can help us identify what pieces went where. A cornerstone sitting on the ground (left) formed part of the fountain’s bottom basin (right). The elements of the fountain were stacked like totem pole. The bottom element features carved classical allegorical heads from whose mouths water gushed into the carved bowls below. Fence material and tree debris cover the carved granite (left) that stood as the fountain base (right). The next element of the stack is the fluted base to the top bowl. Upside down on the ground (left) is the fluted base for the top bowl (right). Several other large granite stones are stacked and marked with numbers, presumably to help in reassembly. The site also contains the rusting remains of the fountain that stood at Truxton Circle, which formed the intersection of North Capitol Street, Florida Avenue, Lincoln Road, and Q Street. The circle was built around 1901 and the fountain installed there originally stood at the triangle park at Pennsylvania Avenue and M Street in Georgetown. Truxton Circle stood at Florida Avenue, North Capitol Street, Q Street, and Lincoln Road from 1901 to 1940, when it was demolished to aid commuter traffic. A newspaper at the time described it as one of the largest fountains in the city. The circle was removed in 1940 to ease the flow of commuter traffic. At that time, the fountain, which may date to as early as the 1880s, made its way to Fort Washington to rust in the woods. 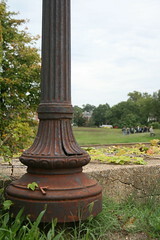 The metal pedestal (left) held up the fountain bowl whose rim rusts in pieces on the ground (right). Notice the classical egg-and-dart pattern. The fountain was also noted for the metal grates that stood near its base. Now these grates sit rusting in the woods. If you want to see the fountain remains for yourself at Fort Washington National Park, go to picnic area C. Beyond the end of the parking lot is a restroom building and behind that is the fountain “graveyard.” A fence encloses part of the site, but you can enter through the large gap down the hillside. Rather than tossing aside our city’s artistic patrimony, we should aim to restore these treasures to the neighborhoods from which they came. Public art is part of what differentiates cherished neighborhoods from unmemorable places. These works remind us of the accomplishments and civic-mindedness of generations past and urge us to carry on the tradition of civic improvement for generations to come. 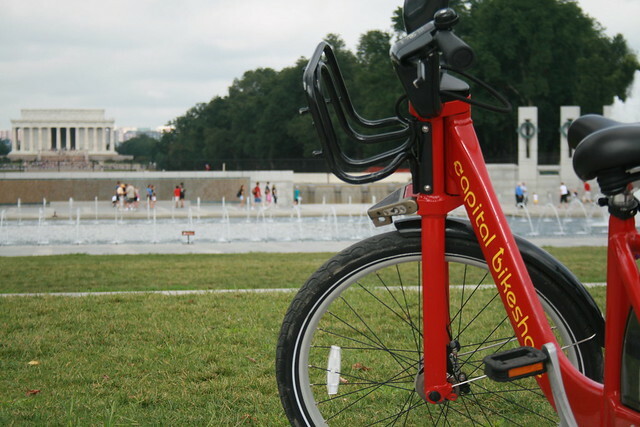 Capital Bikeshare, the District’s smashingly successful bikesharing system, will expand this fall. Unfortunately, the expansion plans for this fall exclude LeDroit Park. The District and Arlington launched the system a year ago with 14 stations in Arlington and 100 in the District. This fall, DDOT will add 34 stations in the District. In our area, DDOT will add a station by the Shaw Library and another at 1st Street NW and Rhode Island Avenue NW in Bloomingdale. These additions should help alleviate the pressure placed on the existing stations at 7th & T Streets NW in Shaw and at Florida Avenue and R Street NW in Bloomingdale. Currently, LeDroiters and Bloomingdalers compete to use these two stations and thus frequently leave the stations empty or full during rushhour. Last week DDOT Director Terry Bellamy announced that the district will add 50 stations early next year. 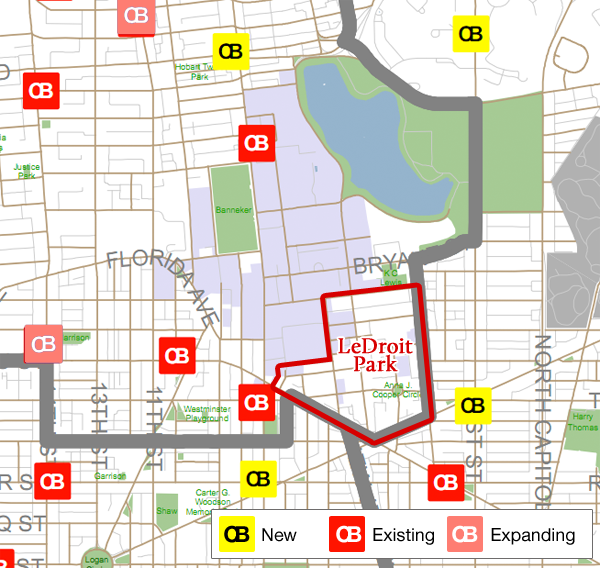 We hope that in this new round DDOT focuses more attention on LeDroit Park and other neighborhoods in ANC 1B. For instance, a Capital Bikeshare station could easily go in at the Park at LeDroit’s south entrance at 3rd and Elm Streets NW. This location is central to the neighborhood and could bring some extra eyes to the park throughout the day. Outside of LeDroit Park, there is a noticeable station gap in the northern reaches of Bloomingdale and around Cardozo High School. Car ownership is relatively low compared to the rest of the nation, region, and city. This inclines people to bike more. Parking is particularly difficult on many neighborhood streets, thus making cycling more attractive. The historical development of this area has permitted the close proximity of commercial uses to residential uses. This means trips to shops and restaurants are short and easily made by bike. Downtown is a short ride away and biking is often faster than taking the bus. 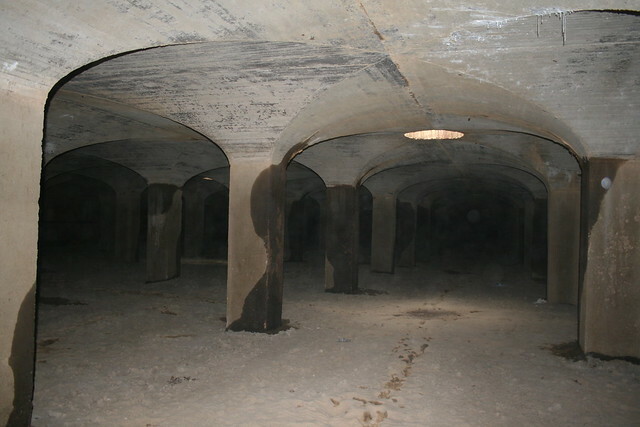 This weekend we got a rare tour of the dormant McMillan Sand Filtration Site just north of Bloomingdale. 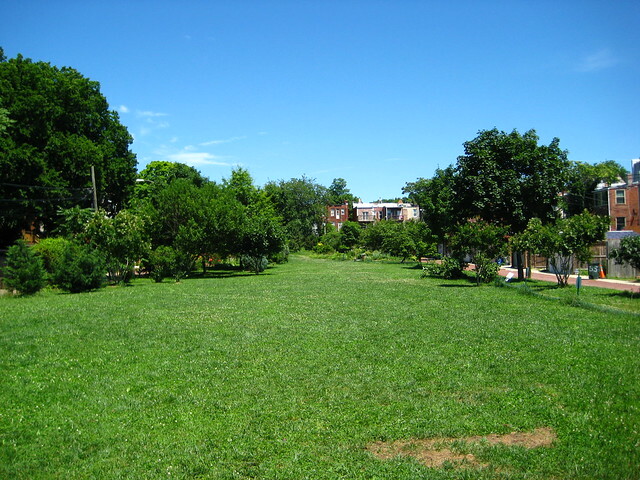 The site sits behind locked fences between North Capitol Street, Channing Street NW, 1st Street NW, and Michigan Avenue NW. 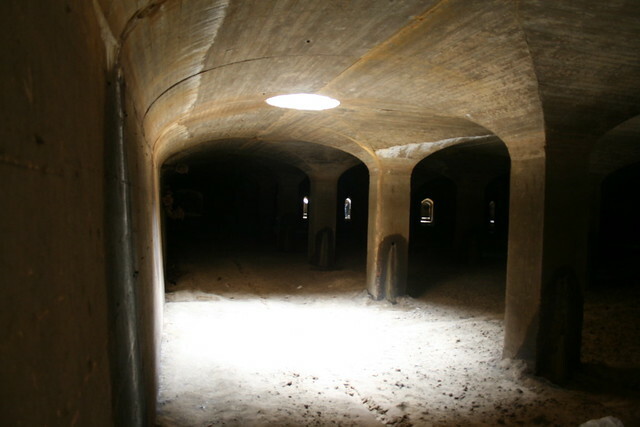 The filtration site opened in 1905 to purify river water supplied to a burgeoning capital. The filtration plant contains 25 acres of underground sand filtration cells. 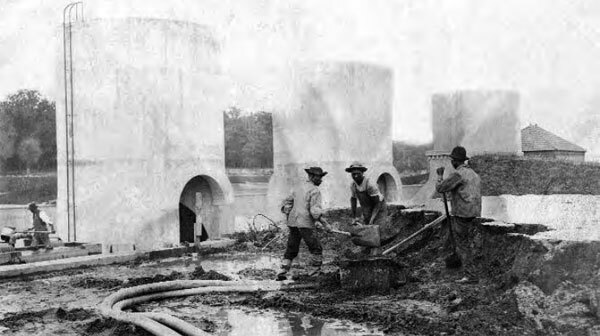 Water flows from the “castle” on McArthur Boulevard NW at the Georgetown Reservoir through an arrow-straight tunnel to the valve house on 4th Street at the McMillan Reservoir. The reservoir opened in 1902 and is actually a dammed stream valley. Since the reservoir stores untreated river water, the water must be cleaned before it can be distributed to residents’ taps. At the turn of the 20th century, a debate ensued between proponents of chemical purification and slow sand filtration. Slow sand filtration won the debate and Congress provided money to build the sand filtration cells. The process of slow sand filtration is pretty simple. Water fills a cell that contains 2 feet of sand at the bottom— it’s like an underground beach. The water percolates through the sand leaving contaminants behind in the sand. When the water reaches the floor under the sand, it exits the cell and is distributed into the city’s water pipes. The sand itself required routine cleaning to remove the contiminants. Clean sand was stored in the concrete silos that stand in rows on the site. Workers replenished the cells by dumping clean sand through the various access holes on the roof of each cell. In fact, an early photo shows fresh sand dumped into a cell. 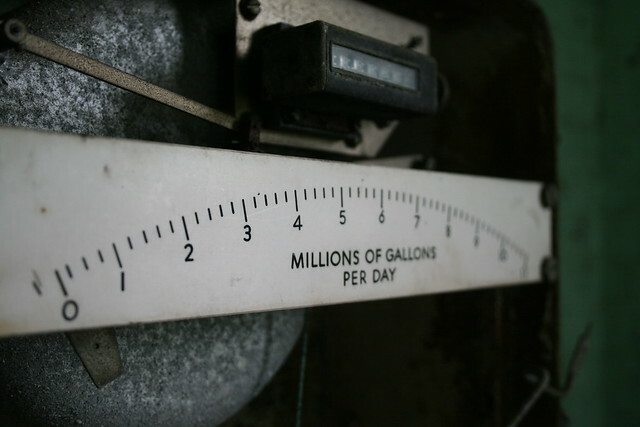 Regulator houses contained valves for regulating the flow of water through each cell. 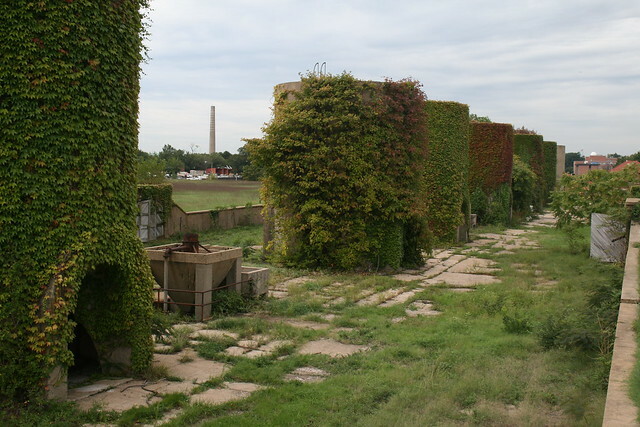 The top of the filtration site was turned into a park, as envisioned by Sen. James McMillan (R – Michigan), famous for his ambitious McMillan Plan to beautify Washington. Frederick Law Olmsted, Jr., designed the park grounds on top of the sand filtration cells. Since the park closed to public access during World War II, the park’s recreational features, including green lawns, park lamps, walkways, and staircases, sit decaying today. 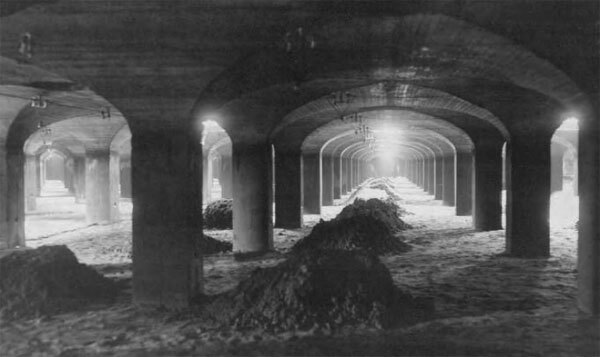 In the 1980s, the U.S. Army Corps of Engineers build a rapid sand filter on the part of the reservoir west of 1st Street NW, thus obviating the need for the slow sand filters east of 1st Street. The western section today holds the active open-air reservoir and rapid sand filters that supply clean water to much of Washington. That section, which is still an active reservoir and water treatment plant, is closed to the public. What’s most unfortunate is that the western section contains the most notable feature of the reservoir park. Shortly after Sen. McMillan’s death, Congress and donors in his home state of Michigan decided to honor the senator with an ornate fountain to adorn the park that bears his name. 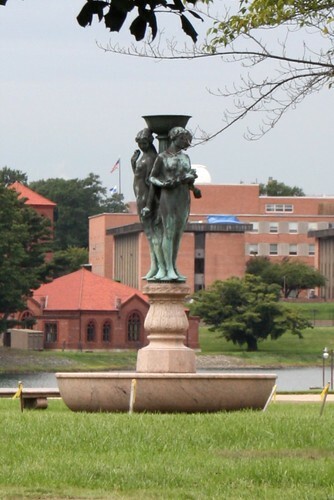 The 1912 fountain, designed by Herbert Adams, contains a bronze sculpture of 3 nymphs on a pink granite base. In 1941 the fountain was dismantled, left in storage and mostly neglected until the top portion of the fountain was returned to Crispus Attucks Park in 1983. In 1992 the top section was moved to its current location, at the active reservoir site, locked away from public access. One can still see the top portion of the fountain by glancing through the fence on 1st Street NW. The base of the fountain remains somewhere in Fort Washington National Park in Prince George’s County. Perhaps someday the District, the federal government, and neighbors can raise the funds to reunite and restore the fountain for public enjoyment. LeDroit Park, when it was established in 1873, was one of the first suburbs of Washington. BestMalissa on Can you identify LeDroit Park’s 12 distinct architectural styles? Christian on That was fast! 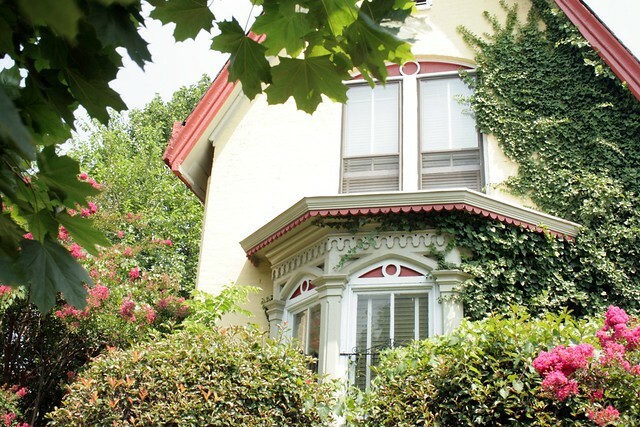 Neighborhood of the Day, Day 21 Truxton Circle – Mitch Curtis Homes on Where is Truxton Circle? BestAlison on Can you identify LeDroit Park’s 12 distinct architectural styles?